Be the first to share your favorite memory, photo or story of GYSGT Paul. This memorial page is dedicated for family, friends and future generations to celebrate the life of their loved one. 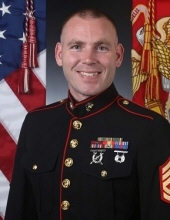 On Sunday, March 31, 2019, United States Marine Corps Gunnery Sergeant Paul D. Bush passed away at the age of 33. A life fully lived, but gone much too soon. Paul enlisted in the Marine Corps in March 2003 at the age of 17 and celebrated his 18th birthday while attending recruit training at Marine Corps Recruit Depot (MCRD) San Diego, Calif. Paul, then Private First Class, attended the Basic Aviation Common Course in Pensacola, Fla. where he earned his Military Occupation Specialty designation as a Radar Technician. During his time in the Marine Corps, Paul deployed to Iwakuni, Japan. He also supported his unit during ongoing operations in the Middle East while assigned to the USS John C. Stennis where he attained the rank of Sergeant. Upon his return to the United States, Paul was selected to represent the Marine Corps as a Canvassing Recruiter within the 9th Marine Corps District. As a Basic Recruiter and then Career Recruiter, he was promoted to the rank of Staff Sergeant and Gunnery Sergeant. In January 2017, Paul was hand-selected by Marine Corps Recruiting Command to serve as a Basic Recruiter Course Instructor at the Marine Corps Recruiters School aboard MCRD San Diego. He immediately set himself apart from his peers by earning top instructor honors on numerous occasions. With steadfast devotion to his duty, Paul screened and trained over 1000 Canvassing Recruiters, who have went on to serve and recruit throughout the Nation. Paul was the recipient of many accolades on recruiting duty and was awarded the Navy/Marine Corps Commendation Medal and Navy/Marine Corps Achievement Medal with gold star for superior performance of his duties. While Paul pursued his career in the Marine Corps, he managed to find the time to enjoy his never-ending list of hobbies: hunting, fishing, boating, motorcycling, renovating houses and literally tinkering with anything he could get his hands on. Paul had recently received his contractor’s license for the State of Kansas. Throughout it all, Paul found Gillian, fell in love, got married and started a family. A doting father, Paul loved being Haisley’s dad and enjoyed his time with his Little Princess. The Marine Corps instills the values of honor, courage and commitment. Commitment was what Paul regarded most. His commitment to his family, friends and the Marine Corps could be seen and felt in everything he did. Family and friends can proudly say that Paul made a lasting impression on everyone he met with his charm, which was only surpassed by the size of his heart. His energy, kindness, harmless mischievous side and genuine zest for life are what those closest to him will remember most. Paul will forever be loved by those he left behind. He is survived by his wife, Gillian Bush, and daughter, Haisley; his mother, Sandra Bush, and father, Billy Bush; his siblings, Leslie and her husband, Kyle McQuain, Josh Bush and Tricia Bush; and Chris and Cheryl Hoover. Paul will also be missed by the many, many friends whose lives he touched and who are now considered family. All will miss the joy and love that he brought into their lives and couldn't be more proud of him. A visitation is scheduled at Highland Park Funeral Home, 4101 State Ave., Kansas City, Kan., Sunday, April 14, 2019, 7:00 pm to 9:00 pm. A memorial service will be held at Highland Park Funeral Home, 4101 State Ave., Kansas City, Kan., Monday, April 15, 2019 at 10:30 am with interment at the Leavenworth National Cemetery, 150 Muncie Rd, Leavenworth, Kan., at 12:30 pm. Immediately following the burial, there will be a Celebration of Life at Ten Penny Restaurant 529 Cherokee St, Leavenworth, KS 66048. To send flowers or a remembrance gift to the family of GYSGT Paul D. Bush, please visit our Tribute Store. "Email Address" would like to share the life celebration of GYSGT Paul D. Bush. Click on the "link" to go to share a favorite memory or leave a condolence message for the family.